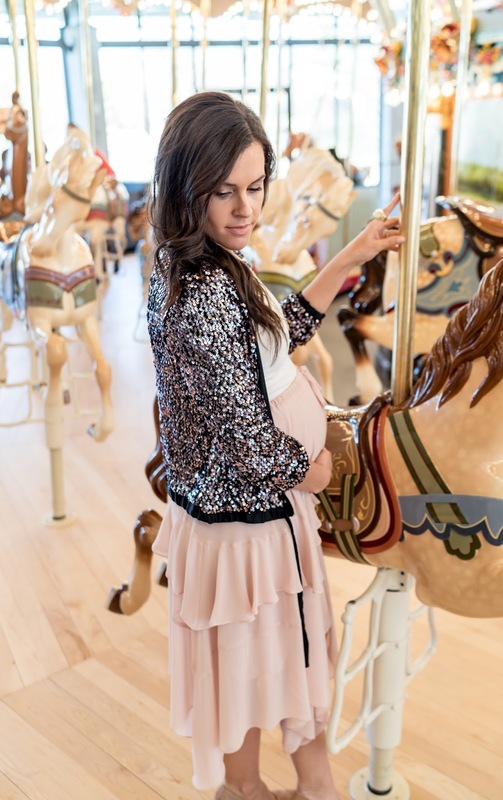 When I found out I was going to be doing a photo shoot on a carousel I was so excited to find the perfect outfit. For some reason I had “ballerina style” in mind for my inspirations. I thought a pleated skirt over my bump would flow nicely, had no idea what top I would find but had velvet mary jane pumps in my mind for footwear. The problem with having a specific outfit in mind is if you can’t find it, shopping becomes very frustrating. Not only do I have my belly as a huge styling inconvenience but I didn’t know what the other girls were wearing so I had a hard time picturing how we would look together. I know it’s not necessary for me to over think our “story” and our looks will always go great together because we are expressing out personal style, after all, we are style bloggers. The stylist in me always comes out when I style a shoot for a magazine I think of a story for the model(s) and a theme. 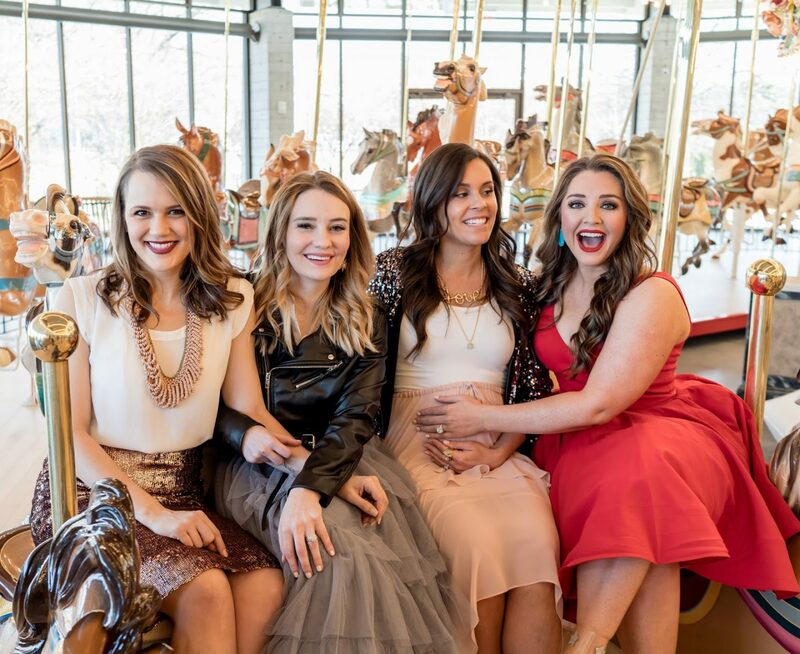 When Bluff City Lights does a shoot I get obsessed with how the four of us will look together. I try not to let the girls know but for this shoot I did send them a thousand pictures because I wasn’t feeling myself. Now, I knew Collins was wearing her red dress, Megan was wearing her gray tulle skirt and Alex was wearing her sequined skirt. I like to pick my outfit out last because I can visualize how we’ll look together. The bad part about picking my outfit last is I obsess a little too much, some may just say I have some OCD tendencies! -I was on the hunt for a blush flowy skirt. I knew this would fall nicely over my belly, bring in the color of Alex’s skirt and having another mid-length skirt to go along with Megan’s would be perfect. I didn’t find this skirt until 7pm the night before the shoot. After I fed Myles and got him ready for bed I left him with his dad so I could quickly go to the mall and was soooo lucky to find what I was looking for! – I tried a lace black turtleneck, a halter black bodysuit (thinking of my ballerina idea) and this white top. Black seemed too harsh for the carousel and the white felt light and right. I had seen these red heels at the mall and thought I needed them to tie in Collins’s dress but they just weren’t going with my outfit. I knew I needed to just dress myself and knowing Collins had a dress instead of separates I knew would be the perfect pop for us. You don’t ever want to look like you are trying to match, coordinating is key. -The next morning I went through my jewelry and shoes and was ready to go. But my look was missing something. It was missing sequins, I needed to tie in the bling Alex was bringing to the shoot. 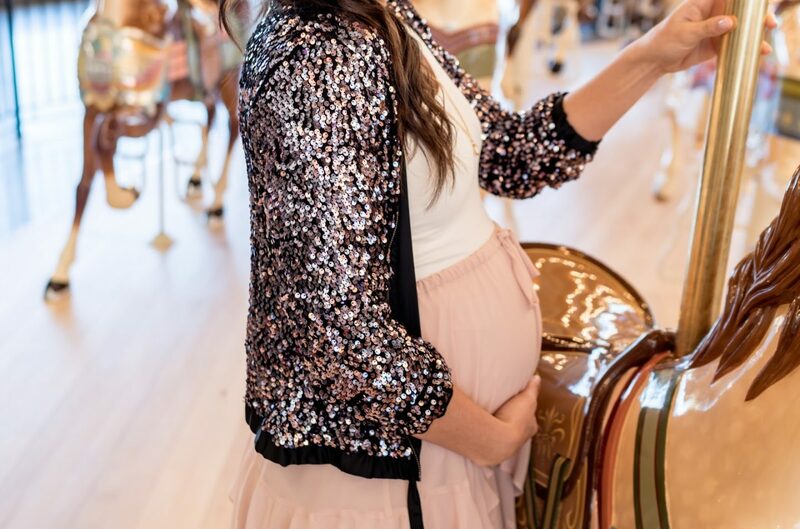 Thank goodness I had my Gap sequined bomber jacket from 2010. This jacket has become a staple because I find a way to wear it at least once a year! -I’m not usually this OCD about picking my Bluff City Lights outfit out but my thoughts were quite entertaining and I’m sure you agree! The time I obsessed most over trying to coordinate was for the 2017 ESPY Awards with my husband, the pressure was really on! Riding the 100 year old renovated carousel at The Children’s Museum of Memphis was a really cool experience, I didn’t realize the carousel was so historical. 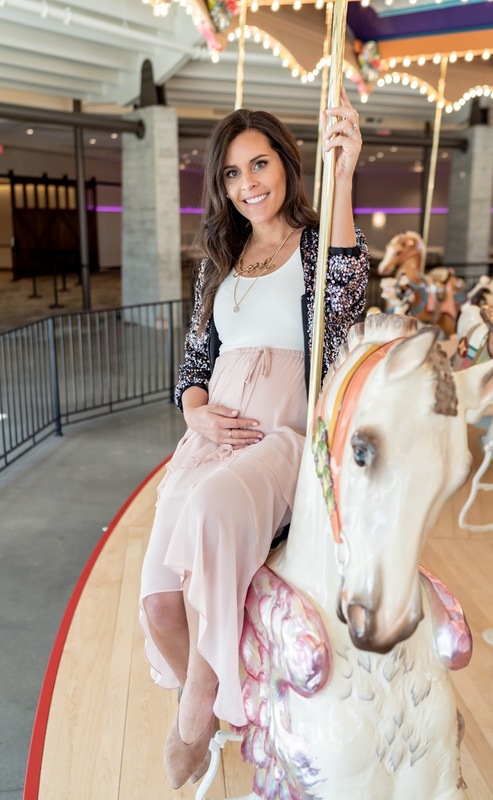 I also hadn’t ridden a carousel since I was a child and it was so much fun! It went pretty fast, we were all laughing the whole time. We are happy to be able to support the Children’s Museum which has a positive impact on the community and provides hand on learning experiences. 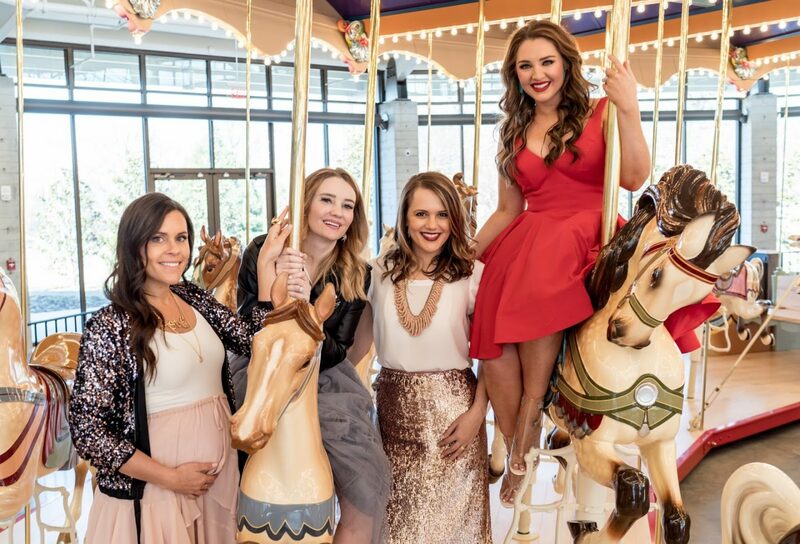 Cirque du CMOM is taking place February 3 at 7pm benefiting the Children’s Museum and Bluff City Lights will be attendance, coordinating or not:) The theme for the evening is “Over The Top, Under The Big Top”, stay tuned for what we’ll be wearing. You can purchase tickets here. I talked about breaking down my outfit above with my obsessive coordinating ways! But I actually love the way this turned out. Nothing I’m wearing is maternity. My skirt has an elastic waistband and can be worn below or above my bump, for those not preggo you can wear this skirt at your waistline. Am I crazy for my way of thinking! ?